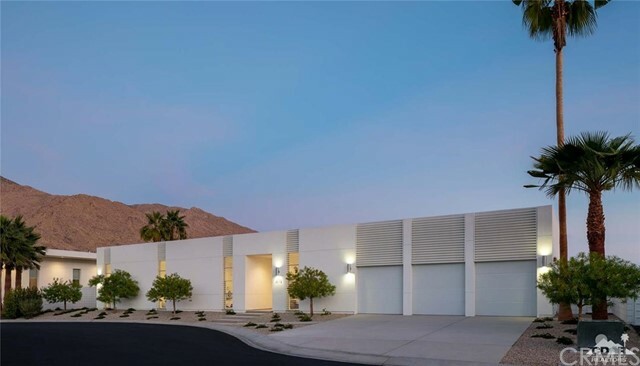 All Palm Springs homes currently listed for sale in Palm Springs as of 04/23/2019 are shown below. You can change the search criteria at any time by pressing the 'Change Search' button below. If you have any questions or you would like more information about any Palm Springs homes for sale or other Palm Springs real estate, please contact us and one of our knowledgeable Palm Springs REALTORS® would be pleased to assist you. "Nestled into the mountainside high above Palm Springs rests this one-of-a-kind retreat set on 72 acres. The compound, comprised of five villas offering 5 bedroom suites, 2 bedroom caretaker dwelling and spa side pool house is surrounded by waterfalls, swimming pool, spas, ponds, terraces, walking paths, hiking trails, and an outdoor amphitheater perfect for entertaining or yoga. The main villa contains the open living room, kitchen/pantry and a secret 2000+ bottle wine cellar. The formal dining room seats 32 comfortably. The Rock House, built by famed architect Albert Frey, features a 2-room suite with walls of glass, fireplace, Balinese garden doors, claw-foot tub, and rock shower. The master and guest bedroom suites offer a touch of Provence with natural rock walls and authentic architectural elements. Tucked away from the world, yet minutes from Palm Springs Int'l Airport, this sprawling estate offers maximum privacy, an enviable natural setting, and awe-inspiring views." "La Piedra presents the deserts ultimate lifestyle! Located in one of the most exclusive & iconic neighborhoods, this extraordinary architectural masterpiece was unveiled after 7 years of construction, using 700 tons of hand cut Idaho Quartz. This magnificent sculpture appears to grow organically out of the mountain. Floor to ceiling walls of glass showcase unprecedented 360 degree views of Palm Springs, the desert & the mountains beyond. There are impressive stacked stone walls that support the home & fill its expansive space with a feeling of power & energy. Massive wood beams set on top of the stone anchor the spectacular glass dome centerpiece of the great room. The master suite & two guest suites feel as if they float & each offer exceptional views. Glancing beyond the pool is the hidden self contained two bedroom guest house. The pinnacle point fire pit hovers over the cliffs edge & offers breathtaking city light views. Estimated replacement value is in excess of $20 million." "This extraordinary California Contemporary home appears to be suspended in air, almost as if in flight over the Palm Springs airport surrounded by its city lights, the windmills in the distance and the snow capped mountains beyond. The interior space is luxurious and comfortable with its wide open living and entertaining areas filled with all of the amenities that one could dream of. The automated retracting walls of glass create a seamless indoor/ outdoor living space. The master suite is fit for a King and your guests will feel royally pampered in one of the 4 additional luxury suites. This spectacular home offers a magnitude of entertainment features with its 10 seat theater, billiard, game and bar area, infinity pool surrounded by fire pits to enhance the jaw dropping city light views. There are 2 outdoor kitchens, a putting green, 3 powder rooms and an elevator to the penthouse level. This is The Ultimate Lifestyle!" "This extraordinary and romantic Southridge tennis estate with the most amazing views and privacy is on the market for the first time in over fifty years. Massive double wooden doors lead you into a private open air courtyard and one of two pools. Inside this graceful home you are surrounded by walls of glass that merge the indoors with the panoramic valley floors and mountains beyond. The main living areas consist of living room, family room/bar and raised dining room, a well separated Master Bedroom suite, three additional guest bedroom suites and two staff bedrooms - all with exceptional views. The grounds are manicured with lush landscaping and natural stone paths. The luxurious second of two pools features an infinity edge, located at the furthest point of the property's mountain edge. Included within this offering is a one 1 acre lot featuring a hard surface tennis court and separate private driveway with room for additional parking, for a total of approximately 2.25 acres." "One of the most spectacular Estates to be built in Old Las Palmas, this exceptional private home & grounds boast a pedigree featuring the nationally acclaimed architectural team of M. Brian Tichenor & Raun Thorp. As featured in their book Outside In - The Gardens and Houses of Tichenor & Thorp, the home was designed to showcase an exquisite art collection, while simultaneously emphasizing the surrounding landscape. A seamless indoor/outdoor flow connects via a series of bronze-framed French doors, transporting you from the Pavilion style main house to Tuscan style gardens & pool area. Enjoy remarkable San Jacinto mountain views from poolside or the private rooftop deck. Pale stone floors throughout the home add serene glamour. All bedrooms are en suite with private patios. The Master Wing features a separate sitting area with fireplace, expansive walk-in closet & spa-like bathroom with separate patio & luxurious outdoor shower. An exceptional property in the premier location." "Bird Streets Luxe meets Palm Springs Glam. Simply one of the finest, most comprehensive mid-century renovations in the desert. Located on .33 acres in the Historic Tennis Club, this legendary home is equal parts Hollywood Regency, Parker Hotel whimsy, and utter luxury. Rich in provenance and still owned by the original family, the 4,535sf winged interior includes original architectural details, enhanced by a clean and modern design aesthetic put in place during the recently completed two-year renovation which left no mechanical system or surface untouched. You will be awestruck by the professionally appointed kitchen outfitted in orange and white. Netflix and chill? We have a media room for that. Cocktails and a kiki? The living room is the perfect spot. 5BR/4BA including indulgent master suite and bath. First class outdoor space with circular pool, numerous lounge areas, lush landscaping and fire pit. The Palm Springs dream house!" "Simply perfect. Designed by Donald Wexler protege Lance O'Donnell, this modernist architectural home has been expertly finished to the highest level of quality. Poured terrazzo floors, cedar lacquered ceiling, white aggregate block and double reveal highlight the overwhelming attention to detail. Dynamic linear presentation reminiscent of the case study homes, this contemporary take on desert modernism offers a gallery style interior with cliff hanger views of the city and mountains. Suspended over the city, one is perpetually stunned by the setting around you and the ever-changing light and shade of the natural landscape. Bulthaup kitchen with Gaggenau appliances and Agape bathrooms continue the dialogue of high design and luxurious amenities. Truly of one of a kind custom architectural offering unlike any other." "This opulent and remarkable Estate, formerly owned by Jack Warner and known as Villa Aujourd'hui, was once a Hollywood haven for film stars and artists such as Elvis Presley and the surrealist Salvador Dali. Enjoy dramatic mountain views, expansive private gated grounds, and palatial pool where Marilyn Monroes' first photos were taken. Originally built in 1958, the interior was designed by William Billy Haines, Decorator to the Stars. This gem is located in desirable neighborhood of Old Las Palma, walking distance of downtown. In 2010, 2-year renovation of ~$1M returned property to original modern style featuring birch kitchen cabinetry and open-style dining. Historical amenities preserved: solid brass doorknobs, 200-year-old French wallpaper and travertine fireplace by Haines. Property features 7 bedrooms, 8 bathrooms, walls of glass, San Joaquin mountain range view. Guest casita with two Master suites and wet bar opens to inviting pool that pampers lavish accommodations." "Held for now but can be shown. Call 4 details. Hope to go on Middle March. Enjoy resort living in this spectacular re-built gated estate in one of the most famous locations in Palm Springs, right on border of Old Las Palmas and Little Tuscany. Privately situated on over 1/2 acre of incredibly manicured grounds, this beautiful mid-century home of nearly 5000 sq ft is ideal for those who love to entertain. The walls of glass throughout the home overlook the lush landscaping and resort-style pool/spa. Features include 4 bedroom suites, including a large master suite with sitting room, and a huge separate casita with private living room and large bedroom, walk-in closet and bathroom, ideal for guests or in-law quarters. Other features include a gourmet kitchen with island, owned solar power, Fleetwood pocket sliders, fire pit, and more. Just a few doors from Richard Neutra's masterpiece, the Kaufmann House and the Jack Benny Estate. Don't miss out on this incredible opportunity." "Known worldwide as Look Magazine's House of Tomorrow and designed by William Krisel, this avant-garde and futuristic residence was constructed by Bob Alexander of the Alexander Construction Company in 1960 as his personal residence. Also dubbed as the Elvis Presley Honeymoon Hideaway, this architecturally significant home with 4 intersecting pod wings is sited on a large private lot with west facing Mt. San Jacinto views and features soaring ceilings, abundant clerestory windows, built ins and generous use of stone and rock, established landscaping, fountains & a large swimmer's pool. A sweeping staircase takes you to a second floor circular Master en-suite. This one of a kind home offers endless potential as a primary residence or vacation rental. Prime Vista Las Palmas location and is easily accessible to Palm Springs Airport, the I-10, and walkable to the Uptown Design District offering chic retail, eateries and art galleries." "Stunning panoramic mountain views from every corner combined with meticulously manicured grounds set the tone for this elevated resort lifestyle. Open concept layout with high cathedral ceiling accentuate south facing sun filled views. Situated directly across the renowned Kaufman House in the Little Tuscany neighborhood, this custom built gated estate with private tennis court, pool, spa is perched upon a prime 1 acre view lot and set to please the most discerning buyer. Master bedroom with expansive closet and spa like master bathroom. En-suite bedrooms with walk-in closets and private patios. Flex space ideal for home gym. High end custom features abound including central vacuum system, Fleetwood sliders, Control4 A/V system, LED lighting, and smart home control. Oversized 4 car garage for your car collection. Conveniently located minutes from downtown Palm Springs and airport. Perfect place to call home, use as corporate retreat, or invest as high end vacation rental." "Located in the heart of highly sought after Old Las Palmas, this magnificent private estate boasts one of the largest lots for sale in the area, at just under 1 acre. This one of a kind property is set in an unbelievably beautiful park-like oasis, amongst an abundance of trees, lily ponds, waterfalls & six outdoor patios, walled & gated for the ultimate privacy, yet outstanding open views avail from every room in this uniquely designed home. Enter the property through the front gate to breathtaking views of the San Jacinto Mountains soaring above you, vibrant colored flowers & set on a beautiful green lawn with the soothing sound of a waterfall flowing into the lily ponds. This will really take your breath away! Move on through the large elegant knotty Alder & stain glass entry doors to the expansive foyer and views out to the pool area & garden. Stroll out french doors to a resort like pool area with tanning deck, built-in barbecue area, kitchen & large granite serving/entertainment bar. Indoors prepare extravagant meals for dinner parties from your impressive chef's kitchen, utilizing the large circular formal dining room. Host an intimate soiree in the phenomenal fireplace gathering room while serving drinks from the full bar, gazing out through walls of glass which frame views of garden/pool & the magnificent mountains beyond. This private estate is a few minutes walk to newly developed, very chic downtown Palm Springs." "Mesmerizing & scenic views await you in the former home of Magda Gabor (sister to Eva & Zsa Zsa Gabor). This stunning & unforgettable Estate sits on 6 acres (subdivide or build) at the top of Little Tuscany & showcases the best panoramic views of Palm Springs and beyond! This home has maintained its elegance throughout the years. Double door entry opens to the spacious family room, which features walls of glass as well as mirror walls providing for extensive panoramic views wherever you look! The expansive Master Suite is situated in its own wing of the home & boasts its own sitting room with secluded views, stunning master bath w/ original sunken tub, shower stall, walk-in closet, & make-up room/office. The lavish kitchen features all Viking appliances (including 60 range, dishwasher, refrigerator, wine refrig, warming drawer & microwave) & the most beautiful stone countertops you've ever seen! Mosaic tile pool is the centerpiece to the stone decking & it boasts the best views ever!" "This Old Las Palmas mini estate was rebuilt and expanded down to the studs in 2014. The 2 year renovation was done to perfection for the private use of the Seller. The home required extensive and costly upgrading to bring the property to current code. A total of 4 bedrooms, including a brand new casita with bedroom, living area & kitchenette. The main house was re-imagined to include formal living, kitchen open to dining area & family room w/ views of pool, spa w/ tanning bed and front cantina w/ mt vistas. The Master suite was expanded to include one of 3 fireplaces in the home and walk-in closet. Gourmet chef's kitchen overlooks the front garden, mountain views & private courtyard. The rebuild included all new desert landscape within and outside the walled and gated property. The flagstone entry path & drive was mirrored with new flagstone in the covered back patio. Low maintenance, close to the 'Uptown' area offering restaurants, shops and entertainment." "One of the best lots in all of the Movie Colony, this amazing property is one of a kind! Enter the Historic, recently restored 1933 Spanish Estate and step into the life Charlie Farrell, Mr. Palm Springs . This fabled Movie Colony estate includes original architectural details. One of the largest lots for sale in the area which includes multiple oversized fire places, beamed ceilings and an impressive great room with four sets of French doors opening to the enormous central outdoor living space with lush mature landscape. Enjoy the formal living room, dining room and a remodeled chef s kitchen boasting white marble countertops, stainless steel top of the line appliances with windows galore. Retreat into the expansive master suite with two sets of doors opening either to your private rose garden or to enjoy the breathtaking mountain views. The additional bedroom with yet another set of French doors also opens to the sprawling central outdoor living space embracing the oversized pool, spa, mature fruit trees and the dramatic mountain views. Exit the main house to the casita adorning one bedroom, one bath, a living room and a kitchenette. Relish the numerous lounge areas, walled and gated grounds for ultimate privacy, and the numerous sets of outward facing double doors throughout the property that make this the true epitome of indoor outdoor living at its best. The Palm Springs dream house! 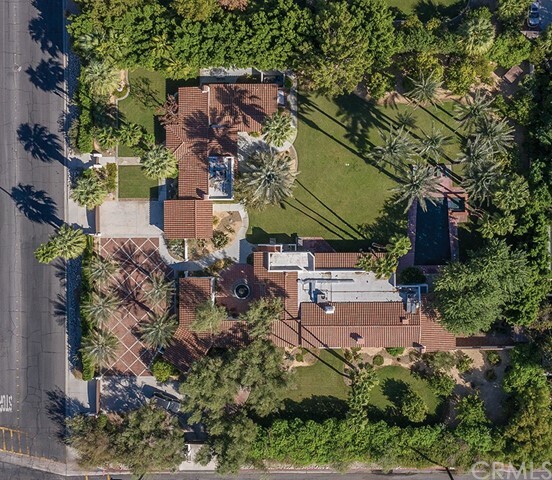 Both 630 E. Tachevah and 1120 N. Via Miraleste are sold together for $3,745,000"
"Originally designed by Cliff May, this Spanish style home in the heart of Old Las Palmas is a home that defines luxurious and beautiful desert living. On over a half acre the property sits tucked behind mature trees and along a curved street. Stunning western views and a slight nod to the south with u-shaped design framing the mountains of San Jacinto. Gated entry and gracious walkway welcomes to expansive lawn. Upon entering wood vaulted ceilings offer volume and doors to the pool easily connect the indoor and outdoor living spaces. The ultimate entertainer's kitchen with huge island, dining area and den with Fireplace is the perfect place for large gatherings or just a quiet night at home. Nearby, you'll find a beautiful bar and lounge with built in wine cabinet and powder room. Two bedrooms in the main house and two room, guest-house provide unparalleled separation of space and all bedrooms are en-suite with the master bedroom enjoying two bathrooms." 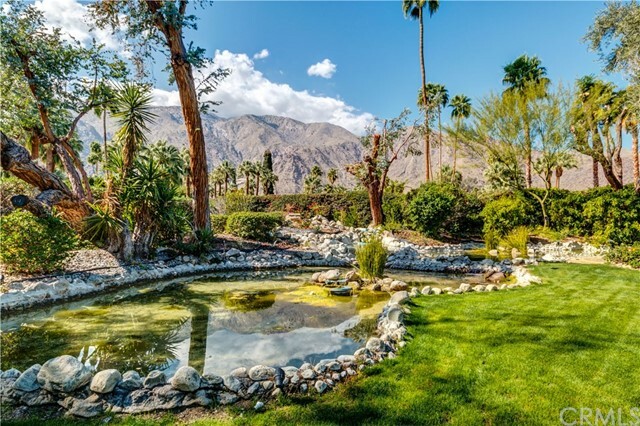 "The stunning architecture of this 1967 custom estate located in South Palm Springs is revealed once you enter the gates off of Bogert Trail in South Palm Springs. Circular drive and dramatic Porte-cochere entry exposes the preeminent materials that were used for construction. Very generously sized rooms make up much of the roughly 8389 square feet home that features five guest suites in the main house and separate guest house complete with kitchen and living room. The entire house features voluminous ceiling heights with floor to ceiling windows, dramatic fireplaces and open living concepts certainly ahead of the trends in the late 1960's. Large family style kitchen can accommodate large parties or just an intimate dinner for two. Just over two acres with lagoon style pool with waterfall features and north/south facing tennis court. This property has been in the same family since it was built and is the epitome of architectural California Ranch." "LINEA'S last amazing T-Plan' on a gorgeous wraparound 17,800 sf lot PRIVACY! The centerpiece of the home is floor-to-ceiling walls that open on both sides to the east and west to become one with the outdoors as the air flows through your living space. Newly imagined by award-winning Alta Verde Builders, Residence 12 offers the perfect desert resort lifestyle. A sensory experience, this expansive home is also replete with luxe features like a draped steel cabana, sparkling 50-foot lap pool with spa, Bocce Ball court, fire pit, a glassed-in entryway wine vault and a media theater that opens up an entire wall into the back yard. It's the last corner lot with unobstructed South Palm Canyon views and is one of the few remaining homes in the unprecedented private gated community of architectural estates at LINEA. Open daily from 11AM-5PM. (Photos are of model home)"
"Experience the warmth and beauty of Bella Monte in this guard gated community. A rare gem to own fee simple land without an Indian Lease in sought after South Palm Springs. Cantera stone columns, fountains and lush landscape welcome you outside this desirable and distinguished property. This estate expands over 7,000 square feet with a magnificent and majestic Mediterranean style compound. Once inside experience 20 foot living room beamed ceilings and walls of glass, and an octagon family/media room with a step-down bar for entertaining. This is pristine and prime property with an elegant and exquisite master bedroom and spa-like master bathroom. A backyard oasis where you can relax and refresh pool side, with waterfall spa, as you and company enjoy the breathtaking mountain views. Entertain with an extended covered patio that is a room to itself with neighboring wet bar, BBQ. This villa residence is five bedrooms, seven baths and three car garage." "Remarkable Redesign Of A Charles DuBois Mid Century Estate In Vista Las Palmas. This 5 bedroom & 6 bathroom home was built by George Alexander in 1958. The timelessness of the mid century architecture with tongue and groove ceilings & original rock fireplace intertwine seamlessly with the modern design. The 3,757 sq ft of interior living feature Italian porcelain tile throughout. Open kitchen with center island & recycled glass counters plus Viking & Subzero appliances. Spacious master suite has a cedar lined walk in closet & is adjacent to office & laundry room with dog shower. Stunning master bathroom features floor to ceiling Terrazo shower with a stone composition tub. The textured wall, floating vanities & Brizo fixtures exhibit the elegance of this lavish bathroom. Four additional ensuite bedrooms all have uniquely styled bathrooms. Detached casita in back has kitchenette & it's own bathroom. Stunning views of Dry Falls & Mt San Jacinto from gorgeous backyard with pool & spa." "Here is a chance to own in the historic Mesa neighborhood. This 5600+ sq. foot compound was originally occupied by the Gillette sisters at the King Gillette estate in Palm Springs. This beautifully restored home has the finest upgrades: Walker Zanger terra cotta floor tiles, Walker Zanger Alhambra bath tiles and Ann Sacks hand painted kitchen tiles just to name a few. It also has been upgraded with state of the art appliances: Sub Zero refrigerator and refrigerator drawers, and a Viking cook-top It comes complete with 3 Bosch dishwashers and 5 separate HVAC energy efficient systems. Please call for a private tour." "Exquisitely blending historical importance and timeless design theAlexander House (namesake Dr. Franz Alexander) is truly an extraordinary property. Created in 1956 by Walter S. White who worked with Frank Lloyd Wright, Albert Frey and Rudolf Schindler the 3200 sq, ft property offers infinite views of the Coachella Valley while offering privacy and seclusion. The residence offers three bedrooms and four bathrooms as well as an oversized two car garage. The pool which is perfectly circular in shape has been completed with a separate hot tub. V shaped steel supports the expansive wall of windows on the homes South side and also features a circular steel fireplace and White designed steel pendant chandelier as well as open tread, black steel staircase created by another luminary, Albert Frey. The property is listed on the National Historic Register and is arguably one of the more important pieces of architecture in the Coachella Valley and would qualify for the Mills Act we are told." "NEW CONSTRUCTION like nothing else currently available in The Movie Colony area of Central Palm Springs. This unique offering includes a main house with an open great room floor plan, chef's kitchen featuring Smeg and Fisher Paykel , dual master suites plus a separate family room and full bar. The Main house and Guest House are 100% 24 x 48 Porcelain tile plus wall covers and tile work providing splashes of texture and color throughout the living areas, bedrooms and baths. A true master retreats starts with Amazing views of Mount San Jacinto and Dry Falls, a master bath of dual walk in finished closets, dual vanities with Bluetooth mirrors, a generous soaking tub and a dual entry open master shower. Across the new pool and elevated spa is a two-bedroom, two bath guest-house with an outdoor kitchen. Besides the pool and spa, the entertainers yard also includes dead on Western Mountain Views, a built in BBQ island and a full outdoor shower. Truly a one of kind property not to be missed." "Newly constructed by Alta Verde, this home is the Entertainer's Paradise'. A perfect Palm Springs playground: oversized classic oval pool, a pool house/lounge that opens out to this amazing 17,000 sf. lot replete with sunken round spa, fire pit and outdoor kitchen with beautiful mountain views. The spectacular 12' plate glass Master Suite hallway further defines elements of this iconic minimalist all-white home. Walls of glass, measured proportions, and sculptural massing - all are delivered in this ultra modern salute to Mid-Century architecture. There's even a collector's garage that holds four cars! LINEA is Palm Springs' living re-imagined and at its best! Open daily from 11AM-5PM."